If a builder or a contractor has told you your house is suffering from subsidence and sinking, you may have considered underpinning. But conventional concrete underpinning disturbs the physical structure of your house and in turn, your life. With underpinning you’re forced to move out of your home for months while massive holes are dug beneath your home. To make things worse, underpinning is extremely expensive. It can cost between $20,000 to $100,000 to have your house underpinned. It may even be more if your house is a larger one. Underpinning is a cost-prohibitive, invasive and obsolete process. At Buildfix, we offer a progressive solution that ensures your home’s foundations are stabilised for good with no underpinning required. The process begins with an investigative phase in order to prescribe the right repair method for the problem at hand. Overall, our solution costs a fraction of what it costs to underpin. In most cases, our work only takes one day and you don’t need to leave your home at all. Instead of digging holes and building concrete pins, we inject GeoPoly™ into the ground at strategic points under your home. GeoPoly™, our proprietary geo-polymer resin, fills voids, stabilises weak soil and can raise walls up to 10 mm or more depending on ground conditions. 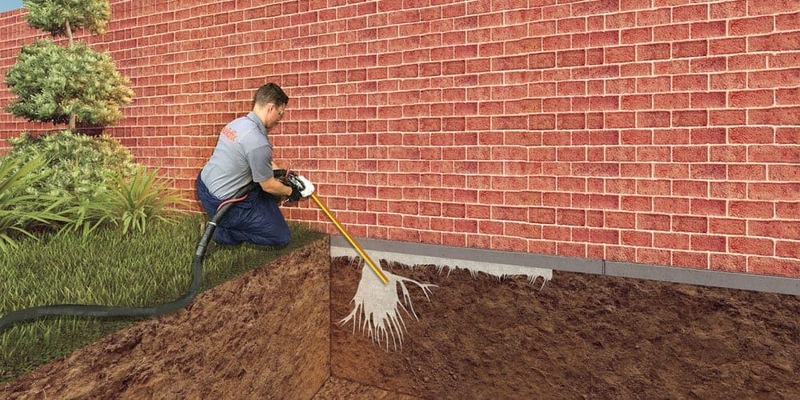 To inject GeoPoly™, we drill 1 cm access holes about a metre apart through your home’s external brickwork until we reach the soil under the wall. Through these holes, we inject the resins at high pressure through a lance into the weak, aerated, eroded soil or voids in the soil. We monitor the entire levelling and stabilisation process with laser equipment to ensure the ground has been levelled correctly and solid. At the end, we remove the lances from your walls and fill the holes leaving them as if they were never touched. Our internal foundation repair process is almost the same as the external one. The difference is we drill the 1 cm access holes internally, from floor level or in a sub-floor space. 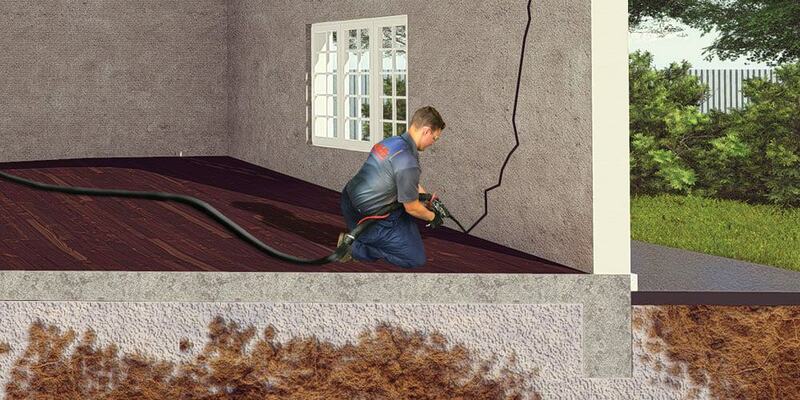 Once we’ve reached the soil under your floors, we inject GeoPoly™ at high pressure through a lance into the defective soil or voids. We monitor the entire process with laser levelling equipment. Once the process is complete, we remove the lances and refill the holes leaving everything looking as new. Need an underpinning alternative today? Old-school engineers may prescribe a traditional underpinning solution but it’s likely they’re not going to guarantee results. In fact, the Australian Standards (AS2870-2011 Appendix B3 Performance of Walls) recommends that underpinning should be avoided when problems appear to be related or brought on by reactive clays. If you’re looking for an underpinning alternative that’s reliable, affordable and isn’t disruptive, we offer it, starting with a FREE inspection of your house.